Two people will disagree in a relationship. This is a given. How a couple responds to these disagreements strengthens or weakens connections. Relationship patterns kill us—or save us. What are your patterns? Habitual interactions create the fabric of our relationships. We develop these healthy and unhealthy patterns, choreographing the swings, dips and cross-overs of intimacy over time. Habits subtly invade every encounter. We don’t recognize them—they appear normal. We act and react without thought. Complex factors combine, initiating a learning process, changing brain connections that draw the blueprints of behavior. In relationships, these complex motivators of behavior multiply by two, as individuals combine their learning and reactions to those of their lover. By recognizing the triggers setting these harmful patterns into action, we can be warned of upcoming troubles before emotions drive us down unforgiving roads and familiar dead-ends. With fore-warning, we can avoid a damaging chain of events. Strong emotions deter calm mindfulness, pulling thoughts from introspection and into fury. If we wait until the emotions arrive, the feelings overwhelm and sweep us into the damaging cycles, requiring renewed promises and additional repairing of hurt. Repair and promises don’t wipe clear memories. The past remains, haunting the future. New disagreement takes on the energy from the unsettled arguments, enraging the soul before different options can be explored. Stored emotions charge each new disagreement with unsolvable force. The growing resentment—if ignored—taints all communications. Until we unearth the hidden emotions, mundane disappointments will ignite fierce and painful conflict. The relationship is doomed. Either partner can struggle with emotions, lacking tools to suppress overwhelm, they explode, run or shutdown. Studies indicate that men are more likely to be emotionally overwhelmed than women. But whether it is the man, or the woman doesn’t matter; once emotionally over-loaded, the course of discussions quickly change; what started as simple disagreements turns to bitter character assassinations, name calling, and emotional shut-down. These downward conversational spirals signal the breakdown of the relationship. When we leave these hurtful patterns unattended, they cause irreparable damage to relationship and damaging the psyche of everyone. "Once emotionally over-loaded, the course of discussions quickly change; what started as simple disagreements turns to bitter character assassinations, name calling, and emotional shut-down." We must be sensitive to approaching emotions, battening down the hatches, and securing vulnerable and delicate valuables. When emotions run hot, conversations become destructive. Lost in emotion, ego protection trumps problem resolution, we lose footing and slip into destructive patterns; little is solved in emotionally charged confrontations, further discussions are futile. Pause, step away—the problems can wait; continuing in emotionally charged states leads to foolish and hurtful words that sting, leaving hurts that continue into future negotiations. Even when the moment has passed, and the relationship appears to have recovered, the hurtful words still scar the soul, waiting for the next confrontation to leap to action and remind of the threatening nature of conflict. Partners don’t have to agree. Some disagreements stem from fundamental differences that never can be resolved. The autonomous differences can remain without diminishing intimacy. But these differences will resurface, requiring skilled negotiations. If we ignore fundamental differences, believing them resolved with a single discussion, then their return continual return frustrates. By pretending we converted our partner with shrewd and crafty genius, we miss the point of individualism. When unresolved issues continue to intrude, we express anger—our partner’s failure to change challenges our wisdom. The unresolved and unaccepted differences interrupt the connection and spoil the relationship. Labels: An over-simplified reason given to explain behavior. We assign an all encompassing character trait to small slips in behavior. The label later biases fair judgments of future action. The issues aren’t the problem; ignored unresolved issues are the trouble. A better way, instead of fighting for rightness, is showing our partner that we respect the differences by willingly struggling to see their point of view, and then deferring right and wrong judgment. Being heard and respected enable partners to transcend differences. Dividing issues often spark insecurity; but with respect, we promote security even while disagreeing. When we make a partner’s dignity paramount, showing concern for their emotions, we can disagree with maturity, without conversations deteriorating into protective and damaging attacks. When simple issues morph into overgeneralized statements and character assassination, the words cut, hurting feelings and resolving nothing. The harsh encounter imprints painful memories that are stored for future discussions. 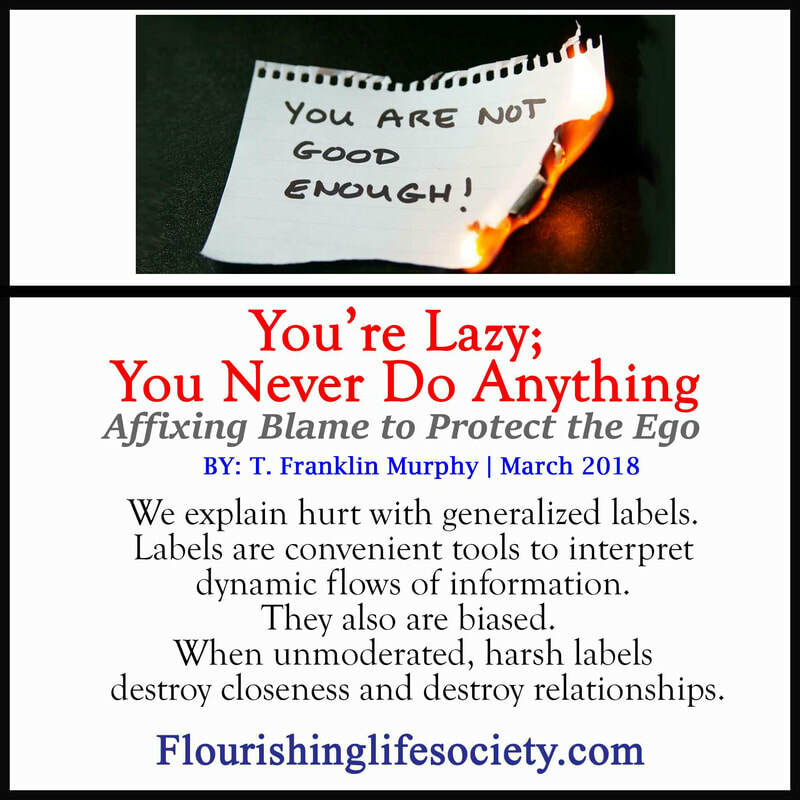 A simple discussion over unwashed dishes doesn’t degenerate into stabbing comments of character, “You’re lazy; you never do anything around the house.” Perhaps, there are work equity issues to be addressed, but this normal complication won’t be resolved through heated and hurtful comments. Adulterated interpretations do not balance the unfairness. The accused partner scurries away feeling like an innocent victim, or vehemently attacks with impunity. This path doesn’t resolve the original issue, the dishes remain in the sink. Break the destructive chain. We must intervene when hot triggers are pushed, creating new helpful patterns. If surprised and emotions intrude, wait until flames cool, reaffirm love, share your feelings and then re-engage in the never-ending work of problem solving; and by damn, stop being lazy and do those unwashed dishes, please!